Chinese food is much loved in our home – sadly I don’t make it all that often, there’s quite a bit of prep work but is well worth the effort. 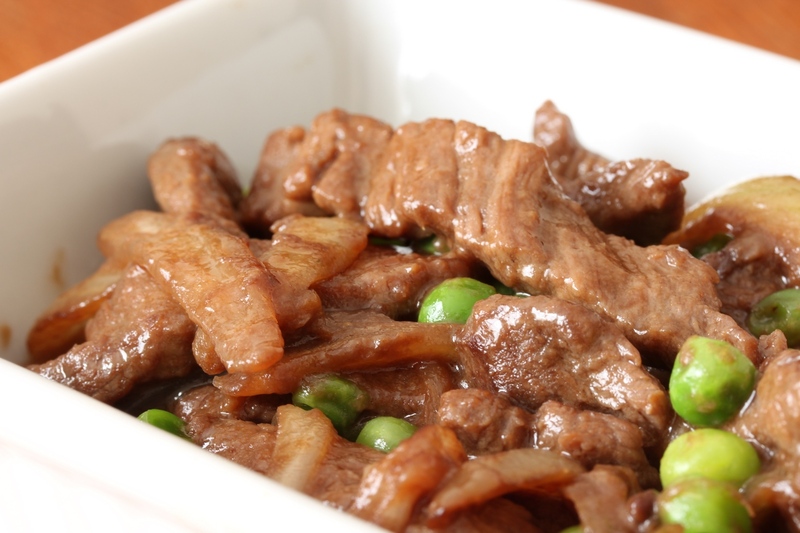 Our Chinese evenings usually consist of Shanghai Steak, Egg Foo-Yong, Sweet and Sour Pork or Chicken and fried rice (sometimes just plain rice). A while ago a lady sent me her recipe for Shanghai Steak and I promised I would try her version when next I make it – it’s only been 2 months! Antoinette, thank you for your lovely recipe. I hope you don’t mind that I added peas in at the end and upped the soy sauce just a bit. This recipe comes together in just a few minutes – as you well know, thats just my kind of recipe and besides the marinating time, cooks in just 3 minutes. Mix the soy, corn starch and sugar together in a bowl. Stir in the onion and steak and marinate for 2 hours. Stir fry the steak over a high heat in a little oil for 2 minutes. Stir through the peas and cook for 1 minute. This entry was posted in Daily Blog, Meat, Recipes and tagged Beef, Chinese, Chinese Food, Cooking, Food, Mandy Frielinghaus, Recipe, Shanghai Steak, Steak, The Complete Cook Book by thecompletebook. Bookmark the permalink. That’s so easy and looks yummy. Will give it a try next time. Ooh yes please – no Chinese Restaurants Up the Mountain so when we fancy it, we have to make it. And I know where I can get some decent thin fillets of steak now to make this! My type of recipe too! I have the steak out already!! oh and i meant to tell you I make your home made mayo at least once a week at the moment.. with piles of herbs in it! I could eat off a spoon (and do) have a lovely day mandy!! Looks lovely and super healthy, too. Yummy! Looks great, I took steak out this morning but don’t have 2 hours to marinate, so perhaps fish and chips tonight and this delicious looking dish tomorrow! Thanks Mands, I’ll let you know I’m flippin starving and looking forward to supper. That really looks good Mandy…I was just looking to see if you had a good recipe for fried rice. Seems like I tried one from someone’s blog that was just perfect & now I can’t find either the blog or the copy I printed. I know it’s pretty straightforward and you can dump just about anything in but I think I’m just not getting the soy sauce amount right. I can see where adding the soy could be too much. So do you add some eggs into the rice too? I know the recipe I had tried, I pushed the rice off to the side then sort of scrambled an egg in there & mixed it up. I think I could have used more onion in my last batch since it was just too bland. Mandy, you are not supposed to have me drooling before lunch time here lol. This looks absolutely amazing! That sounds tasty! I’ll have to give this one a try soon. Simple, delicious and uncomplicated, quick weekday meal. I shy away from Asian dishes because of the prep time, even though the shortened cooking times very often make up for it. This recipe sounds perfect. I just wish I’d seen it before I’d gone to the grocery this morning. It would have made a great dinner tonight but I guarantee it will grace my table soon enough. Thanks, Mandy, and have a great weekend. Cooks in just 3 minutes?! That is my kind of cooking – especially this time of year. 🙂 Mr. N will be a huge fan of this recipe. Chinese food is his favorite type of cuisine. Have a great day Mandy! Great dish! I would use rump steak for this, cheap, tasty and still pretty tender. This reminds me of my youth! My parents had dear friends–our ‘extra grandparents’–who had been missionaries in China long ago, and they introduced us to the joys of Chinese cuisine. The true home-cooked humble stuff. One of the dishes our ‘grandpa’ taught Mom to make was a dish very like this but with celery and carrot slices instead of the peas. So very comforting and simply delicious!! What a mouthwatering meal! This steak looks absolutely scrumptious, Mandy. Great recipe! Looks good – enjoyed your Mauritius post too. Need a lil touch of crunchy nuts to the dish………. Love how quickly and easily we can make this! We love stir frying! Great!! I was just looking for a simple and easy beef recipe. I must try this, my mouth is watering, lol! I just came back here to see if there were any updates, only to see that my question (from November) isn’t here! No idea what happened, but I’ll try again! I made the Shanghai steak from your recipe, but the steak didn’t have that melt-in-your mouth, moist tenderness that I recall from the takeaway in PE. Mine was a little dry, and had to be chewed quite a bit. Any suggestions as to how I could improve on it, or what I might have done wrong? Hi, made this recipe. DEVINE COULD NOT STOP EATING. Is now a weekly thing.